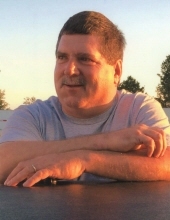 Celebrating the life of Roger Lee Davis, Sr.
Obituary for Roger Lee Davis, Sr.
Roger Lee Davis, Sr., 56 years of age of Raysal, WV, passed away Wednesday, January 30, 2019 at his home. Born August 2, 1962 in Welch, WV, he was the son of Kathleen Shepard Davis of Branson, MD and the late Bob Davis. Roger enjoyed working on cars, enjoyed spending time with his family and was of the Pentecostal faith. He was a loving son, husband, father, brother and friend. In addition to his father, he was preceded in death by his special grandmother Nannie Monaghan. Survivors in addition to his mother Kathleen Shepard Davis, include his loving wife of thirty-one years Rita Lynn Hatfield Davis of Raysal, WV; son Roger Lee Davis, Jr., of Raysal, WV; sister Delores Perdue of Martinsville, VA; uncle and best friend Curtis Monaghan and wife Irene of Jolo, WV; several nieces and nephews including a very special nephew Gage “Dink” Myers of Mountain City, TN, and a host of friends. Funeral service for Roger Lee Davis, Sr., will be held at the Bartley Church Of Jesus in Bartley, WV, Sunday, February 3, 2019 at 1:00 p.m. with Pastor Ralph Brewster officiating. In honoring his wishes, he will be cremated. The family will receive friends at the Bartley Church Of Jesus, Saturday, February 2, 2019, after 6:00 p.m. with evening service to be held at 7:00 p.m. The family of Roger Lee Davis, Sr., have entrusted the care of their loved one to Shortridge-Ramey Funeral Home of Grundy, VA.
"Email Address" would like to share the life celebration of Roger Lee Davis, Sr.. Click on the "link" to go to share a favorite memory or leave a condolence message for the family.